CD4+ and CD8+ T cells stimulated in vitro with a specific antigen can be magnetically labeled with the CliniMACS® Cytokine Capture System (IFN-gamma). In combination with the new CliniMACS Prodigy, the system allows fast and fully automated generation of antigen-specific T cells in a closed sterile system. Viral or fungal infections are a major cause of morbidity and mortality in the period of immune recovery after hematopoietic stem cell transplantation (HSCT)1,2. Adoptively transferred antigen-specific T cells have been shown to restore protective immunity and control established adenovirus (AdV)3,4,13, cytomegalovirus (CMV)5,6, and Epstein-Barr virus (EBV)7,8 infections after HSCT in adults as well as in children. However, the manufacturing of those rare antigen-specific T cells under GMP-compliant conditions is lengthy and very labor-intensive. The CliniMACS® Cytokine Capture System (CCS) (IFN-gamma) addresses all these challenges and provides the perfect solution. Utilizing the CliniMACS Prodigy® Platform, this method allows the fast and fully automated generation of viable antigen-specific CD4+ and CD8+ T cells, e.g., with specificity for HCMV9–12, EBV14, AdV14, BKV15 or multivirus-specificity14. The whole process happens in a closed sterile system and only takes approximately 12 hours. The CliniMACS Prodigy integrates all critical steps of the CliniMACS Cytokine Capture System (IFN-gamma) from antigen-specific T cell stimulation to magnetic isolation and final formulation within 12 h of total time. Importantly, all cell processing steps are automated ensuring a convenient and highly standardized manufacturing process. This application sheet provides an overview of the required and additional materials needed to perform the CliniMACS Prodigy Cytokine Capture System (IFN-gamma) process. It also provides an overview of the process workflow, the setup of the tubing set and literature references. The first step of the fully automated CliniMACS Prodigy® manufacturing process is the stimulation of PBMCs with the antigen of interest, e.g. with MACS® GMP HCMV PepTivator® pp65 (CMV). The automated antigen-specific stimulation of T cells is performed with high quality and GMP-compliant reagents. TexMACS GMP Medium is an optimized T cell culture medium. 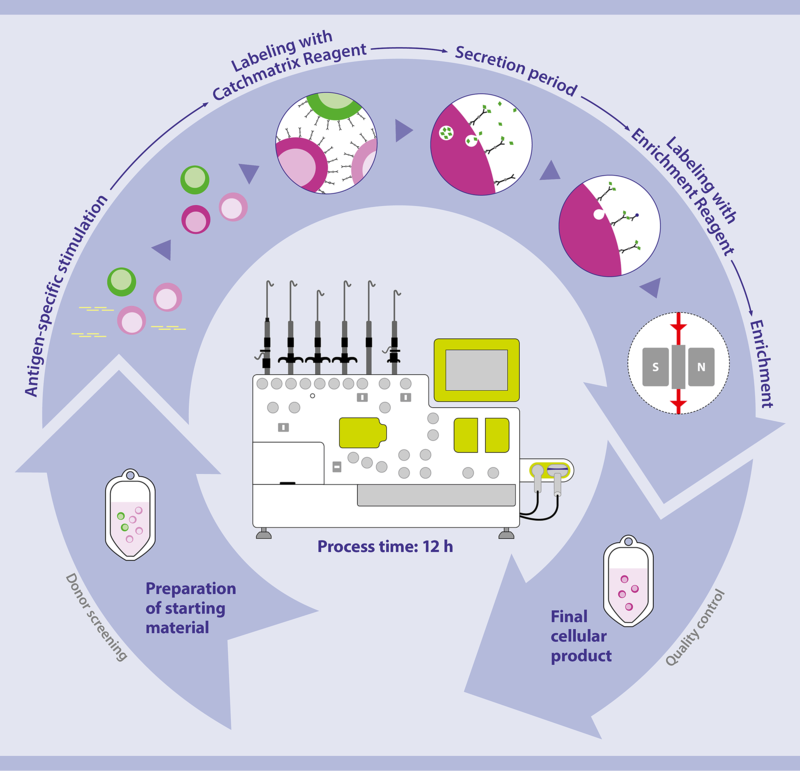 During the automated CliniMACS Prodigy process, the target cells are enriched by a 2-step labeling approach. Step: Labeling of CD45+ cells with the CliniMACS® Catchmatrix Reagent. This is a bispecific antibody, specific for CD45 (binds on cell surface) and for IFN-γ (secreted by the target cells). The IFN-γ, secreted by the stimulated cells, is captured by the CliniMACS Catchmatrix Reagent and thereby bound to the surface of the cytokine-secreting cells. Step: Labeling of cells with the CliniMACS Enrichment Reagent, a second IFN-γ-specific antibody conjugated to MACS MicroBeads resulting in the magnetic labeling of all IFN-γ+ cells. Finally, these cells are magnetically enriched on a MACS Column within the CliniMACS System. The CliniMACS Catchmatrix Reagent and the CliniMACS Enrichment Reagent are components of the CliniMACS Cytokine Capture System (IFN-gamma). Feuchtinger, T. et al. (2008) Clinical grade generation of hexon-specific T cells for adoptive T-cell transfer as a treatment of adenovirus infection after allogeneic stem cell transplantation. J. Immunother. 31: 199–206. Mackinnon, S. et al. (2008) Adoptive cellular therapy for cytomegalovirus infection following allogeneic stem cell transplantation using virus-specific T cells. Blood Cells Mol. Dis. 40: 63–67. Feuchtinger, T. et al. (2006) Safe adoptive transfer of virus-specific T-cell immunity for the treatment of systemic adenovirus infection after allogeneic stem cell transplantation. Br. J. Haematol. 134: 64–76. Feucht, J. et al. (2015) Adoptive T cell therapy with hexon-specific Th1 cells as a treatment of refractory adenovirus infection after HSCT. Blood 125: 1986–94. Feuchtinger, T. et al. (2010) Adoptive transfer of pp65-specific T cells for the treatment of chemorefractory cytomegalovirus disease or reactivation after haploidentical and matched unrelated stem cell transplantation. Blood 116: 4360–7. Peggs, K. S. et al. (2011) Directly selected cytomegalovirus-reactive donor T cells confer rapid and safe systemic reconstitution of virus-specific immunity following stem cell transplantation. Clinical Infectious Diseases 52: 49–57. Moosmann, A. et al. (2010) Effective and long-term control of EBV PTLD after transfer of peptide-selected T cells. Blood 115: 2960–2970. Icheva, V. et al. (2013) Adoptive transfer of Epstein-Barr virus (EBV) nuclear antigen 1–specific T cells as treatment for EBV reactivation and lymphoproliferative disorders afterallogeneic stem cell transplantation. J. Clin. Oncol. 31: 39–48. Priesner, C. et al. (2016) Comparative analysis of clinical-scale IFN-γ-positive T cell enrichment using partially and fully integrated platforms. Frontiers Immunology 7: 393. Kim, N. et al. (2016) Robust production of cytomegalovirus pp65-specific T cells using a fully automated IFN-γ Cytokine Capture System. Blood 128: 5739. Qian, C. et al. (2017) Curative or pre-emptive adenovirus-specific T cell transfer from matched unrelated or third party haploidentical donors after HSCT, including UCB transplantations: a successful phase I/II multicenter clinical trial. J. Hematol. Oncol. 10: 102. Kállay, K. et. al. (2018) Early experience with CliniMACS Prodigy CCS (IFN-gamma) System in selection of virus-specific T cells from third-party donors for pediatric patients with severe viral infections after hematopoietic stem cell transplantation. J. Immunother. 41: 158–163. Pello, O. M. et. al. (2017) BKV-specific T-cells in the treatment of severe refractory haemorrhagic cystitis after HLA-haploidentical haematopoietic cell transplantation. Eur. J. Haematol. 98: 632–634. For the manufacture and use of the antigen-specific T cells, national and international legislation and regulations must be followed. Miltenyi Biotec as the provider of the CliniMACS CCS-IFN System does not give any recommendation regarding the use of the manufactured cells for therapeutic purposes and does not make any claim regarding a clinical benefit.